The 2017 Tax Reform Reconciliation Act (the Act), enacted December 22, 2017, includes a new tax incentive program, Internal Revenue Code Subchapter Z — Opportunity Zones, aiming to promote investments in certain economically distressed communities. Subchapter Z is highly complex, so our research team put together the below 2019 Qualified Opportunity Zone Guide especially for Texas commercial real estate investors. We encourage you to seek the professional advice of a Certified Public Accountant (CPA) and Licensed Attorney, as we are not accountants or attorneys, and this is not advice. C. Potential elimination of tax when exiting a qualified opportunity fund investment. A. The proposed regulations clarify that almost all capital gains qualify for deferral. B. Generally, to qualify for deferral, the amount of a capital gain to be deferred must be invested in a Qualified Opportunity Fund, which most be an entity treated as a partnership or corporation. C. The Opportunity Fund must hold at least 90 percent of its assets in qualified Opportunity Zone property. In addition to the proposed regulations, Treasury and the IRS issued an additional piece of guidance to aid taxpayers in participating in the qualified Opportunity Zone incentive. Rev. Rul. 2018-29 provides guidance for taxpayers on the “original use” requirement for land purchased after 2017 in qualified opportunity zones. There was some question as to how a 00 Fund could “substantially improve” land which this ruling addressed and resolved. Assuming the taxpayer holds its investment in the Qualified Opportunity Zone Fund until December 31, 2026, the gain subject to tax is the lesser of the fair market value of the property at the time of the event or the original deferred gain. Taxpayers will need to value their interest in the Qualified Opportunity Zone Fund in order to capture the correct gain. This incentive may be used as a complementary tool for investors who are also receiving NMTCs or Low-Income Housing Tax Credits. In general, a good rule of thumb for life is don’t spend more money than you make. This is true if for individuals as well as corporations. As a real estate investor, you should have a handle on how much money you have, how much you’re spending, and what your assets are worth. In order to keep track of these and other things, a good accounting system is crucial. Good accounting practices allow investors to increase efficiency and streamline operations. In contrast, poor accounting practices make operations harder and slower. Not only that, but not tracking your real estate investment finances could lead to financial hardship. HOW ARE THE TAX CODE CHANGES FOR 2019 IMPACTING REAL ESTATE INVESTORS? As the saying goes, death and taxes are the only two certain things in life. For real estate investors and owners, taxes are an unavoidable part of life. Not only that, but so are new tax codes change. The Tax Cuts and Jobs ActContentsThe Tax Cuts and Jobs ActTCJA’s Impact on Commercial Real EstateAMT Business Interest Expense Limitation Carried Interest Depreciation/ MACRS (The Modified Accelerated Cost Recovery System)Lower Corporate Tax Rate REITsOpportunity Zones Stay Up-to-date On Tax Code ChangesFurther Reading A commercial real estate investment broker is expected on top of tax code changes for 2018 to best advise their clients. Deferred Capital Gains Tax – You can sell current assets to invest taxable capital gains into O-Funds. Do this within 180 days of selling your assets and you avoid paying capital gains tax (at least until an O-Fund is divested or until December 31, 2026). Basis Step-Ups – Basis step-ups increase your rolled-over capital gains: A five-year O-Funds holding brings a 10% basis step-up. A seven-year O-Funds holding brings an additional 5% (15% total). Fewer Limits – Finally, there are fewer limits on O-Fund investments. There are no limits on the amount invested, the type of taxes you avoid, how much tax you avoid, and the amount of time that gains can compound tax-free. Tax Exempt Potential – Holding O-Funds investment for at least 10 years lets them grow tax-free AND you are exempt from paying capital gains. communities with real needs. In addition to the benefits to the people of Houston, Opportunity Zone investments offer tax benefits to investors. For additional information on investment opportunities in Houston and in Texas, contact CXRE Group today. Qualified Opportunity Zone Funds (QO Funds) must be formed as partnerships (LLCs that are taxed as partnerships would be acceptable), or corporations. QO Funds can invest in income-producing real estate located in an Opportunity Zone, such as an apartment complex, shopping center, or office building. In order to meet the criteria of a QO Fund, 90% of the assets held by the vehicle on the last day of the fund’s taxable year and the last day of the first six-month period of the fund’s taxable year) must be qualified opportunity zone property (QOZ Property) within a QO Zone and the QO Fund must have acquired the property after December 31, 2017. QOZ Property can be qualified opportunity zone stock (QOZ Stock), qualified opportunity zone partnership interest (QOZ Partnership Interest). or qualified opportunity zone business property (QOZ Business Property). Subchapter Z provides incentives for investments in qualified opportunity zones (QO Zones) by means of temporary capital gain deferrals and ultimately permanent exclusion from gross income of capital gains, if certain requirements are met. Under the new law, any gain from the sale or exchange of property by a taxpayer to an unrelated person, that is invested in a qualified opportunity fund (QO Fund), as defined below, within 180 days of the sale of that property is excluded from gross income until the earlier of the date the investment in the QO Fund is sold or December 31, 2026. The law requires only the gain to be reinvested into the QO Fund, not the total proceeds, which is different than other tax deferral tools such as like-kind exchanges. The gain deferred can be any gain (e.g., short-term, long-term, ordinary and Section 1231 gains) in connection with the disposition of property. The taxpayer’s basis in the QO Fund is initially zero but will be increased by 10% of the deferred gain if investment is held for 5 years and increased by an additional 5% if the investment is held for 7 years. Therefore, if a gain on the sale of property is reinvested in a QO Fund within the required timeframe, taxpayers may be able to decrease the taxable portion of the originally deferred gain by 15% (an overall basis step up of 15%) if investment is held up to 7 years. 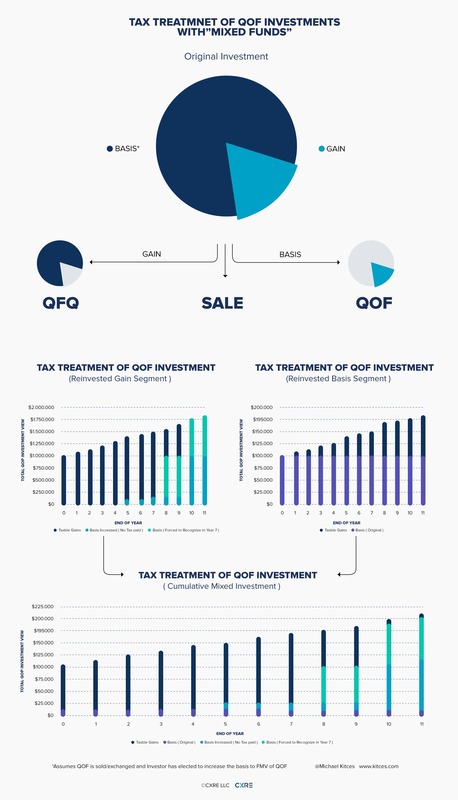 For investments held for at least 10 years, the taxpayer will recognize no capital gain income on the appreciation of the asset from the time of the initial investment in the QO Zone through the sale of the investment (note they still will be required to pay tax on the initial gain used to fund the investment into the QO Fund). Where the taxpayer invests both capital gain proceeds and cash from other sources into a QO Fund (fresh capital), the Act specifically states that the investment will be treated as two separate investments of which only the capital gain proceeds will be eligible for the 10 year capital gain exclusion (and basis boosts). Taxpayer receives a step up in basis in connection with the original $100 of gain of $10 (10%). That is, now they will recognize a gain of no more than $90 from the original $100 of gain. Taxpayer receives a step up in basis in connection with the original $100 of gain of an additional $5 (5%). That is, now they will recognize a gain of no more than $85 from the original $100 of gain. Tax on deferred gain of $85 is due (Assuming the fair market value of the interest in the fund is greater than $85). Taxpayer purchased Amazon stock in 2016 for $50 which is worth $150 in 2018. Taxpayer sells the stock and receives $150 in cash of which $50 is returned to the taxpayer and $100 is invested in a QO fund. The investor holds the investment in the 00 Fund for 10 years. The taxpayer can defer the taxes owed on the $100 of gain until 2026. Further, because the investor will hold the asset for at least 7 years, a basis step up of $15 would be applied and this the tax due will be $20 ($85 times 23.8%) in 2026. Since the investment was held for 10 years, there will be no further tax due on the appreciation of the original $100 investment. Assume the same facts as in example 1, but the investor only holds the 00 fund investment for 7 years. As in example 1, the investor can temporarily defer the tax owed on the original stock sale and will receive the same 15% step up in basis. Thus, the investor will owe the same $20 in tax in the year of sale ($85 times 23.8%) based on the original capital gain; however, unlike example 1 because the investment in the QO Fund was not held for 10 years there will be no exemption from the appreciation on the investment. Assuming the investment grows 7% annually, the taxpayer will owe an additional $15 ($61 of gain times 23.8%) of tax upon exit. Assume the same facts as in example 1, but the investor only holds the 00 fund investment for 5 years. As in example 1, the investor can temporarily defer the tax owed on the original stock sale but will receive only a 10% step up in basis. Thus, the investor will owe $21 in tax in the year of sale ($90 times 23.8%) based on the original capital gain; however, unlike example 1 because the investment in the 00 Fund was not held for 10 years there will be no exemption from the appreciation on the investment. Assuming the investment grows 7% annually, the taxpayer will owe an additional $10 ($40 of gain times 23.8%) of tax upon exit.